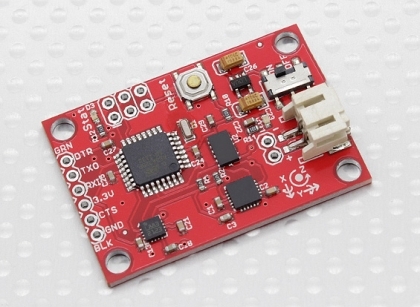 This is a 9DOF ArduIMU includes three sensors - an ITG-3205 (triple-axis gyro), ADXL345 (triple-axis accelerometer), and HMC5883L (triple-axis magnetometer). This board comes programmed with the 5V/16MHz Arduino Pro mini328 bootloader, simply connect to the serial TX and RX pins with a 5V FTDI Basic Breakout. The outputs of all sensors are processed by an on-board ATmega328 and output over a serial interface.This enables the 9DOF ArduIMU to be used as a very powerful control mechanism for UAVs, autonomous vehicles and image stabilization systems.